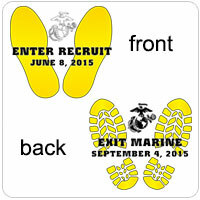 This design features the yellow footprints with "Enter Recruit" and your recruit's ship date on the front, with yellow bootprints and "Exit Marine" and the graduation date on the back. 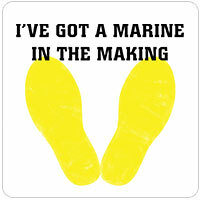 This t-shirt design features the text "I've got a Marine in the Making" with the classic yellow footprints below. 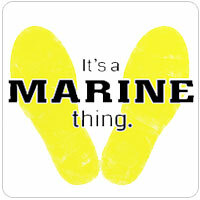 This t-shirt design features the text "It's a Marine Thing" with the classic yellow footprints behind. 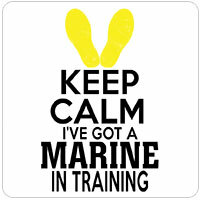 Design featuring the yellow footprints and text "KEEP CALM I've got a Marine in training." 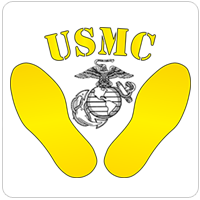 The yellow footprints from boot camp with the Eagle, Globe, and Anchor and "USMC"